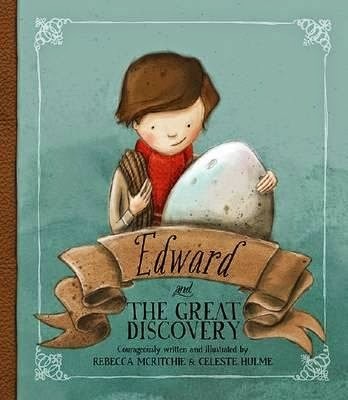 Edward comes from an archeological family. All of them simply love to dig and each and every one has made very important discoveries, yes they have. Edward is determined to join them. So far, he'd done little more than dig a polkadot patchwork of holes in the backyard, but then one fine day ... Edward finds, er - trips over - something interesting. It's an egg--a very mysterious egg, containing a very mysterious should-not-be-here, what-on-earth-is-going-on kind of creature. This adorable story of a very unlikely friendship is not only well-crafted and gently underscored with a rather subtle but delectable humour, its illustrations are truly stunning, featuring a mood palette and structure that will engage the reader and the illustration-aficionado alike. I also adore the scientific undertones of the book, and the final endpaper featuring Edward's archeological kit is something I want to hang on my wall. Hoping for more from this seamless creator duo.